If you suspect that you may be at risk for osteoporosis, talk to your family doctor, who can also refer you to an osteoporosis specialist, if needed. Get enough calcium and vitamin D through diet and supplements – use our hand-out to help you figure out if you are getting enough. If you are prone to falling (i.e., you have a tendency to fall more than twice a year), you can learn how to effectively prevent falls. Do bone-friendly exercises regularly. 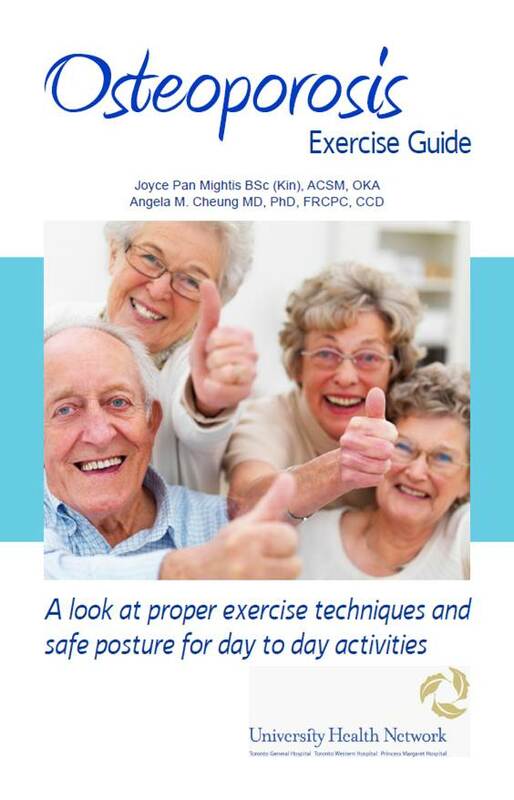 If you are not sure what bone-friendly exercises are, get help through our Exercise Guide and other related content or contact a trained exercise specialist. Maintain healthy weight; being under 60 kilograms (132 lbs) can increase your risk for osteoporosis, and having extra weight can cause more impact during a fall on certain bones like the ankle. If you are a smoker, stop smoking or at least try to reduce it. Contact friendly Quit Coaches, if you are looking for some motivation! Drink less that 2 servings of alcohol per day – one serving equals to a pint of beer, glass of wine, or shot glass of liquor. Get at least two servings of protein a day. One serving of protein equals to approximately 1/2 cup cooked fish, shellfish, poultry or lean meat; 3/4 cup of cooked beans; 2 eggs; 2 Tbsp peanut butter. Take less than 10,000 IU of vitamin A supplement and less than 400 IU of vitamin E supplement per day, because high doses can compromise your bone health. Avoid carbonated soft drinks, because they can help increase bone loss. Drink less than 4 cups of coffee a day, as excessive amount of caffeine can help increase bone loss. Reduce sodium intake by decreasing how much salt you add to your meals and by avoiding meals that are processed, prepackaged or prepared in restaurants. High-sodium diet can not only compromise your bone health but also your cardiovascular health. This is some really good information about osteoporosis. I liked that you said about how you should eat a serving of protein every day to help your bones. I didn’t realize that can help make your bones stronger. Yes – protein helps keep bones strong. Please take a look at one of our sheets (https://osteoconnection.files.wordpress.com/2013/04/protein-handout_osteoconnectioncuhn.pdf), which provides more information on protein and bone health and tips on how to incorporate more protein into a diet.